Though we have open & closed office hours, the owners live on the property and oversee 24/7 the welfare and safety of the guests outside of the normal business hours. Bed checks with treats are preformed every evening to ensure all guests are happy, safe and secure. * During Christmas & New Years Week, Spring Break Week, Easter and Thanksgiving Boarding Rates are $2 more per night. Boarding Rate Discounts All 1st Visit - New Client guests received a 10% discount off the daily boarding rate for the first stay. Bokhara provides many cost saving discounts for Senior Citizens, 1st Responders, Military (Active & Veterans). ​Check Discount Program. Check-in Time: It doesn't matter what time you arrive for check-in as long as it is during our open office hours times on that day. We do prefer arrivals at least 15-30 minutes prior to our closing time on your arrival date. Check-Out Time is 2pm (with a complimentary grace period until 3pm midweek and Saturday before a late check-out fee is charged). Late Check-Outs: On Monday, Tuesday, Thursday & Friday check-outs after 3pm until 5:00pm do incur a $8 extended stay fee. Check-outs after 5pm pay for the full day. On Sundays our open hours are between 9:00am - Noon and again between 5pm - 6pm that Sunday evening. NOTE: Pick-up & arrivals during our Sunday evening hours are for your convenience only and the full day board is charge for all Sunday evening departs. All arrivals or departures between 5pm-6pm on Sunday must be pre-scheduled so we will have staff available for your Sunday evening needs. Dog's signed up for Bathing or Grooming services, Day or Swim Camp on their departure day are not charged the $8 extended check-out fee if they stay past the 3pm check-out time. Special Holiday Rates are for the day of the holiday and the day on each side of the holiday for a total of 3 days charged at the Holiday rate. But, between December 22rd - January 2nd, and the entire Spring Break Week a $1 additional fee is in effect for that entire week. The reason for the $1 increase over holiday and spring break periods is to help offset the additional staffing requirements during those very busy holiday times. Early Arrivals Fees: Please contact us if you are requesting an early arrival time. There are NO check-outs or check-ins allowed prior to 7:45am on any day of the week. Pre-Approved Late Check Ins or Late Depart Fees are charged starting at $25 between our posted closing times and 8pm for that day. After 8pm until 10:30pm there is a $50 charge for opening for a late check-in or a late check-out. There are NO check-ins or check-outs after 10:30pm on any day. Please speak with us directly for pre-approval and to submit a one night non-refundable deposit to confirm the after hours special services. All deposits received are applied to the boarding at check out. The one night deposit is completely separate from the $25 late check-in or late check-out fee which will be charged and is not applied to the boarding fees. THERE ARE NO CHECK-INS OR CHECK-OUTS ON ANY ACTUAL HOLIDAY DATES - OUR HOURS ON ALL HOLIDAY DATES ARE STRICTLY ENFORCED BETWEEN 9:00 AM TIL NOON. Payment: Payment in full is required at the time of checkout. We accept payment in the form of cash, check with valid driver’s license, Visa, MasterCard, American Express and debit cards. We reserve the right to request a non-refundable deposit on all services. Admissions: We reserve the right to deny admittance to pets lacking proof of vaccinations, and/or pets displaying signs of untreated or potentially contagious conditions, parasites and/or aggressive behavior. We reserve the right to charge additional fees for excessively difficult or aggressive pets requiring additional staff and\or additional time in order that we may deliver proper care. Upon admission for services, your signature of contract acknowledges your awareness and acceptance of our policies. Minimum age for all services is 4 months of age with a minimum of two sets of vaccinations current. Health - All pets arriving must be in good health with vaccination records current. Any pet with signs of pest infestations will be bathed at the owners expense. Grooming or bathing is recommended for all pets at departing date. Any pet requiring medical attention will be taken to the veterinarian. Charges will be at the owner's expense. Every effort will be taken to contact pet owner prior to any veterinary visits. All vaccination records must be from a licensed veterinarian. Check to verify your pet has all of our required vaccinations well before your arrival date. For 1st Visit Guests we do want your pet's vaccination records to be faxed or mailed to us in advance (231) 264-6667 so we can verify that all of the vaccinations that we require are current and up to date well prior to your arrival date. Vaccinations: For the safety of all our guests we require your dog be current on vaccinations. * Bordetella Vaccinations: We highly recommend the Bordetella vaccination be by the intra-nasal (nose drop) administration given annually for the best protection against this very nasty virus. Canine Cough, similar to the human "common cold" is highly contagious for which the Bordetella vaccines provide some protection against the virus. With an outbreak of a canine cough strain NOT covered by the vaccinations the exposed dog usually suffers a much milder form of the cough. It is also known the vaccination alone can cause a break through causing a mild form of canine cough, so it is required that all Bordetella vaccinations be given a minimum of five (5) days prior to any boarding stay or grooming visit - we do not accept responsibility for any break through, or outbreaks in this large virus family. ​** Canine Influenza Vaccinations (CIV-Bivalent): Bokhara Pet Resort highly recommends your dog receive the Canine Influenza Vaccine (CIV-Bivalent) covering the H3N8 & N2 strains administered at least five-seven (5-7) days prior to a boarding date. The CIV/Bivalent vaccination is a series of two vaccinations given two weeks apart, then only one vaccination annually thereafter. We do not accept responsibility if your dog comes into contact with this virus - please take steps to vaccinate your dog. Fleas/Ticks: Additionally, we require that you maintain a year-round treatment for ticks and fleas in order to protect our resort from any contamination and protect all of the pet guests. We recommend topical solutions such as Advantage and Frontline. These products are available over the counter or from your veterinarian. We do not suggest the flea/tick collar prevention methods. Please talk to your veterinarian about your options and frequency of treatment. Medication Administrations: We do not charge for most medications, vitamins, food supplements, heartworm meds, or chewable meds if they are readily eaten from the hand, taken in a pill pocket or can be mixed in with their food. Extensive medications (or difficult to pill pets) may be charged according to the administration times and frequency - to be determined. We do not board pets requiring insulin injections. Geriatric Charges may be added if we deem necessary - Starting at $5 per day additional. See our Special Needs Section. Pick up and Delivery Available and charged according to distances. Call us for pricing. Pet Diets: We feel your pet should not have a change of diet during a boarding stay and should be fed the diet you are currently feeding at home. We strongly urge you to bring the diet your pet is used to eating - if possible measured by individual meals in zip lock baggies labeled with your name and the pet name. 3-5 lb. dog food packages will be accepted, but only if they are pre-marked with your last name and the pet name. No large 30-50 dog food bags are allowed unless the boarding stay is for two week or more, or you have multiple dogs. Diets are not included in the price of the boarding rate and we do charge $1.00 per day if we are feeding one of our standard brand dog or cat diets. 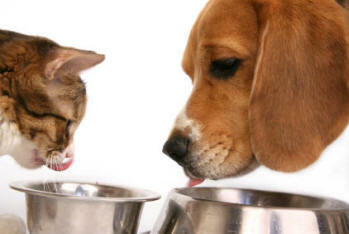 The standard brand for dogs is Iams, and Purina Cat Chow for feline guests. Bowls: We use stainless steel bowls that are washed and sanitized after each use so we discourage you from bring bowls from home. Leash and Collar: Please make sure when you arrive at Bokhara Pet Resort, you bring you're pet into the office on a leash. For safety we remove all choke chains collars and return them to you along with your leash. Reservation Modifications: If you need to make changes to the number of days you have reserved to avoid being charged for the days reserved a seven (7) day notice is required so we will have time to rebook the space that was reserved for your pet. The exceptions to this are Thanksgiving, Christmas, New Years and Spring Break week. Changes for these holiday/break weeks must be made at least 14 day prior to the arrival date to avoid being charged for the days reserved. ​Holidays - Pets with boarding reservations for Thanksgiving, Christmas, Spring Break and Easter will be charged for all days reserved unless we receive a cancellation in a very timely manner. Items From Home: Pets use articles brought in with them as toys and chewing play things, so please do not bring any item which you do not wish to be chewed. Items from home might include toys, towels, small blankets, etc. for these items will contain your household smells and make the pet feel more comfortable while away from home. Please limit the number of items to 2 or 3 pieces. Label all items with your last name and the pets name. Do not bring your pet’s favorite toys. We will take every care with your pet's possessions, but we will not be responsible for items lost or eaten. Keep in mind we do not guarantee the return of these items - please only bring items you consider to be “disposable”. Bedding: If you wish to bring bedding please do not bring anything that can't be washed with bleach as all articles brought in with pets will be returned clean. We say NO to large foam, cedar filled or beds that will not fit into our washer, we request you leave all oversized items at home. Bokhara provides raised Kundura pet cots with comfy bedding and double fleece lambskin pads. Emergency Contact Numbers: Every attempt will be made to provide the care necessary for your pet should an emergency occur. It is important that you leave a phone number where you can be reached or an emergency contact person authorized to communication with the veterinarian so care can take place in a timely manner. If there is an emergency, we contact your veterinarian first. If he or she is unavailable, we contact another local veterinarian. Then we call you at the emergency number you provide. ​Please notify us at check in about any pertinent medical history or problems with your pet. If Someone Else Drops Off or Picks Up Your Pet For You: If you have made arrangements for someone else to drop off or pick up your pet for boarding please let Bokhara Pet Resort know who that authorized person is. We do not accept or release pets from other than the owner unless prior arrangements have been made.